Canasta - a Rummy game with a Latin beat excites with its wild cards and high scoring hands. Canasta ("basket" in Spanish) became the favorite card game of millions when it arrived from South America with the Samba and Bossa Nova. Today, Canasta is still a big favorite with players of all ages and skill levels. 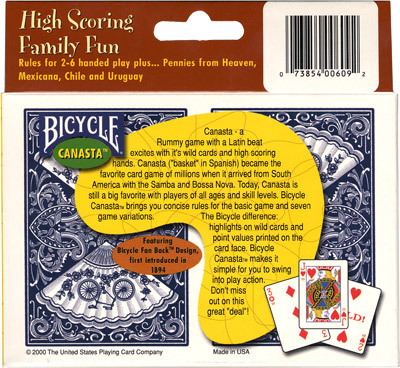 Bicycle Canasta brings you concise rules for the basic game and seven game variations. The Bicycle difference: highlights on wild cards and point values printed on the card face. Bicycle Canasta makes it simple for you to swing into play action. Don't miss out on this great "deal"! 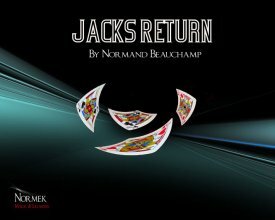 Includes 2 decks featuring Bicycle Fan Back Design, first introduced in 1894 and 24 page booklet. Simply enter your details below and we will send you an e-mail when “Bicycle Canasta Game 2-Pack (Fan Back) - DISCONTINUED” is available to ship!